The charms of any travel destination fluctuate; a lot depends on the day you are there. The person who stands in a freezing drizzle while gazing upon the Eiffel Tower for the first time has a different impression of the experience than someone who is there on a cloudless day in May. If seven giant cruise ships have disgorged their passengers on Cozumel during the time you set aside to explore that island, you’re likely to wonder why anyone raves about it. I talked to someone who had visited Yellowstone not long after the devastating 1988 wildfires that destroyed almost 800,000 acres of the national park. He described Yellowstone as “bleak”; that was the opposite of my reaction when we visited it a couple of years ago. By the time we reached the visitor center of Volcan Poas, we understood why the surrounding area is described as cloud forest. We were in high humidity — a heavy mist — and low visibility. Within minutes, the mist had turned into rain, being driven horizontally by strong winds. We lingered at the gift shop area for almost 30 minutes; Umberto was hoping that the skies would clear. Recognizing that was a futile hope, he led us up a trail to the rim of the crater. The wind inverted our umbrella along the way, but it really didn’t matter, since the rain seemed to be coming from all directions and we were already soaked. 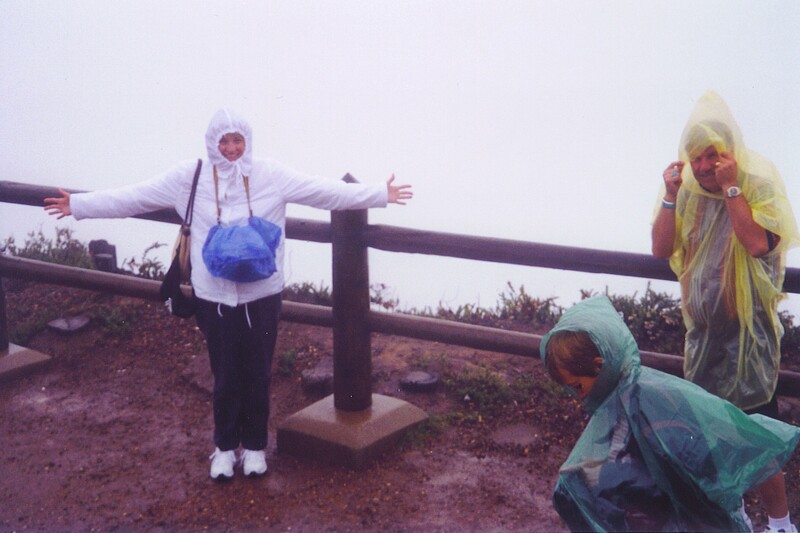 At the observation point, we observed thick fog. It wasn’t possible to see the caldera of the volcano. It wasn’t possible to see anything that was more than fifty feet away. We took a nature trail back to the visitor’s center. Because the canopy of vegetation was so thick, we weren’t getting rained on quite so hard. Eventually our soggy little group was loaded back into the minivan and returned to the city. In truth, we weren’t all that disappointed that we hadn’t seen the volcano — it had been an adventure, and therefore a rather enjoyable day. This entry was posted in Travel and tagged Poas Volcano. Bookmark the permalink.